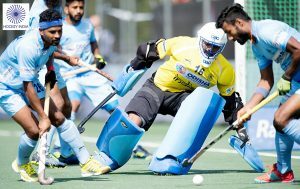 A total of 2 matches was held today in the ongoing Hockey Champions Trophy ’18, between – Argentina Vs Australia , India Vs Netherlands. Peillat Gonzalo scored in the 1st quarter to put Argentina in the lead. The score was equalized by Brand Tim who struck a goal in the 2nd half to make it 1 – 1. In the same quarter, Peillat Gonzalo scored another goal to restore Argentina’s lead. No goals were scored in the 3rd quarter as the 4th and last quarter began. Again, Peillat Gonzalo scored to complete his hattrick and extend Argentina’s lead. Brand Tim scored again but couldn’t score a third as Argentina stunned the table toppers to win the match. Defending from both sides in this match was commendable as no goals were scored in the 1st, 2nd or the 3rd quarter. In the start of the 4th and final quarter, Mandeep Singh opened the scoring for India to put them in the lead. With 5 minutes left in the play, Brinkman Thierry scored for Netherlands and the match ended in a draw. 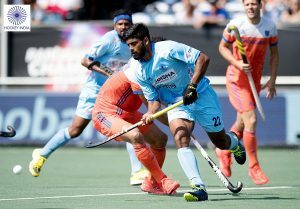 India will now face Australia in the Hockey Champions Trophy Final tomorrow on 1st July, Sunday. What a game @TheHockeyIndia. 2nd Champions trophy finals. What a show by the wall @16Sreejesh ! Surrender Harmanpreet at their best. And you can’t stop this man from scoring important goals @mandeepsingh995. And silently, yet again, the Indian Hockey Team makes it to finals of the Hockey Champions Trophy. You’re no less. You are our heroes, too 🙂 India stands proud. Australia won’t have it easy in the finals. Next articleBreaking World Cup 2018: Uruguay Vs Portugal – Whose Leading?